Many Rosary Makers may wish to make Rosaries to promote the Pro-Life Movement. These Rosaries are special in that they are usually made with a variation of white, and pink and blue Beads, symbolizing the lives of so many little babies lost to the sin of abortion. 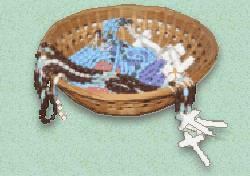 you will want to review our Instruction pages before beginning work on your Pro-Life Rosary. Please pray for all women who may find themselves in a crisis pregnancy. And for the fathers of those babies whose lives will be ended. Pray for all families affected by the scourge of abortion. 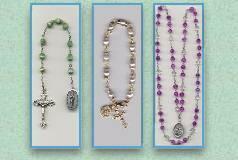 We offer the following suggestions to choose from in making your Pro-Life Rosary. a Center piece which calls to the prayerful mind images of those Special Patrons who intercede for us before God in the cause of preserving the lives of babies who may be aborted, and the Elderly, Coma Victims and other disabled, attacked by the evils of euthanasia and assisted-suicide laws. with some combination of pink and blue beads. from the Culture of Death. Any style Crucifix is appropriate. as usual for any rosary. Use white or crystal for all of the Pater beads. attached by a jumpring at the Center piece. by the prayers of the Holy Rosary. "You will conceive and bear a Son,"
Be it done unto me according to your word." who are afraid to be mothers. and overwhelmed by their pregnancy. to say yes, and the courage to go on. the false solution of Abortion. that comes from doing God's Will.